Carousel Press is based in Berkeley, California. 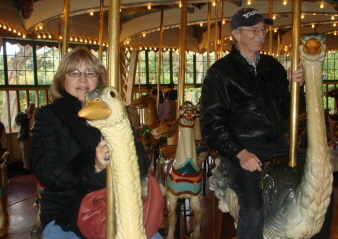 Publishers Carole Terwilliger Meyers and Gene Meyers take a twirl on the carousel at the San Francisco Zoo. Get ideas for your own vacatons from these informative articles by award-winning travel writer Carole Terwilliger Meyers. WEEKEND ADVENTURES IN SAN FRANCISCO & NO. CALIF. This catalogue has been discontinued.